Paxiom Group’s food packing equipment systems are composed of various food packaging equipment machines from our globally known partners. We supply food packaging machinery to various different food industries. Our systems are designed to handle whatever food packaging needs our customers require. First up are our packing solutions for candies, which include flow wrapping licorice; premade pouch packaging solutions for hard or soft candies; vertical form fill and seal bagging for gummies; and filling candy into rigid containers. The equipment utilized for these are The Swify Bagger automatic pouch machine, The Spindexer (for filing rigid containers), and The SleekWrapper. Second, is for fresh produce food packing machine systems like salad, diced onion, shredded cabbage, baby carrots, among others. 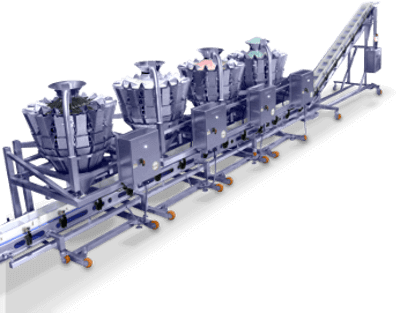 The equipment that we use for such applications are The PrinoCombi, WeighPack container indexing conveyor, The Swifty Bagger, WeighPack vertical form fill and seal bagger, The Breezy Bagger, and WeighPack Wicketed Bagging. We also offer packing systems for frozen foods with the use of premade pouch packaging solutions. These include: frozen fruit and chicken nuggets, vertical bagging for frozen peas and flow wrapping for frozen burritos. The food packaging equipment for this type of food are The Swifty Bagger, WeighPack vertical form fill and seal bagger, and WeighPack Wicketed Bagging. For cheese packaging, we have machines for bagging, wrapping, and container filling different cheese forms including grated, shredded, crumbled, sliced, shaved and whole cheese wedges. We have vertical form, fill and seal machines for cheese curds, R2B horizontal. Form, fill and seal bagging machine, the VS Bagger which is perfect for grated cheese, shredded mozzarella or cheddar, and the SpinDexer for filling grated or shaved Parmesan fresh mozzarella balls or crumbled blue cheese. Another is our set of packaging machines for baked goods and snack foods. Again, we have the WeighPack vertical form, fill & seal solutions, great for packaging cookies, crackers, granola, and more. We also have The Swifty Bagger, The SleekWrapper, and WeighPack Wicketed Bagging. Then for your coffee packaging, our available machines are Vertical Form, Fill, and Seal for ground coffee and beans, The Spindexer which is ideal for filling coffee grinds into tins, and The Swifty Bagger for filling stand-up pouches with grand coffee and whole bean. Then lastly, we have our packaging solutions for snack foods. These solutions include flow wrapping energy bars; premade pouch solutions for beef and turkey jerky; vertical form fill and seal bagging for chips and popcorn; and filling nuts in jars or plastic containers. All of these packaging systems are made specifically to carefully manage our customer’s food packaging needs.